The Food Alphabet and More: Baskin Robbins opens at Greenbelt 5! Baskin Robbins opens at Greenbelt 5! Good news for all ice cream lovers in Makati! Baskin-Robbins, the world’s most beloved ice cream brand now brings scoops of smiles and joy to its recently opened store at Greenbelt 5, Ayala Center in Makati. It is Baskin-Robbins third branch in the country, serving a variety of delectable ice cream sundaes, custom cakes, frozen beverages and more. 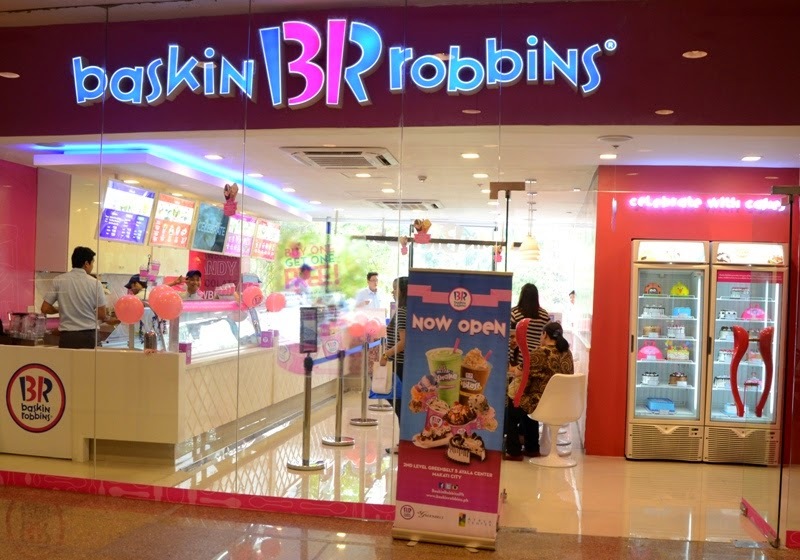 “We are delighted to celebrate this new milestone as we open our very first Makati branch of Baskin Robbins here in Greenbelt,” said Michael Dargani, president of IceDream Inc.
“We are geared towards achieving the brand’s vision of strengthening its presence in the local market, as well as in the global scene. With the expansion of Baskin-Robbins, we strive to get more and more people to experience the height of ice cream pleasure at key locations throughout the metropolis,” Dargani added. Following the success of Baskin-Robbins in Bonifacio Global City and Ayala Fairview Terraces which opened last year, Baskin-Robbins Greenbelt brings to the table its famous selection of 31 unique ice cream flavors that has drawn in many ice cream aficionados in the country. Some of the all-time favorite ice cream flavors include Mint Chocolate Chip, Jamoca Almond Fudge, Very Berry Strawberry, Maui Brownie Madness and Pralines ‘N Cream. The newly-opened store features the brand’s latest shop design which highlights its popular pink and blue colors in a clean, fresh and modern setting. One can enjoy their chosen treat in a bright and inviting atmosphere or simply grab their favorite BR items and go! Apart from Baskin-Robbins’ unique and timeless 31 ice cream flavors, the new Greenbelt shop also serves a delicious range of frozen delights including ice cream cakes, milkshakes, and sundaes. Baskin-Robbins was founded in 1945 in Glendale, California by Burton Baskin and Irvine Robbins, ice cream enthusiasts and brothers-in-law, whose passion inspired what is now the world's largest chain of ice cream specialty shops. As of 2013, Baskin-Robbins has 7,300 shops in nearly 50 countries, with the U.S. having the largest number at 2,500 ice cream stores. Today, Baskin-Robbins is the world’s largest chain of ice cream specialty stores, serving over 300 million customers each year worldwide. Baskin-Robbins Greenbelt 5 opens to the public from 11am to 10pm daily. For more details about Baskin-Robbins, visit their website www.baskinrobbins.ph or check out their Facebook (facebook.com/baskinrobbinsph), Twitter and Instagram (baskinrobbinsph) accounts. Like The Food Alphabet on Facebook. Celebrating the 1st Anniversary of Niu by Vikings with a special anniversary menu made just for you! Max's Chicken All-You-Can is back for 2017!!!! Pizza Express X Bun Appetit - A feast for the Gods! Spin your summer around with McDonald’s desserts! A complimentary upsize for you at Starbucks! All logos and pictures are copyrights of their own brands, if in anyway this has been abused or misused by this website, please feel free to contact me and the picture/logo will be be deleted immediately.